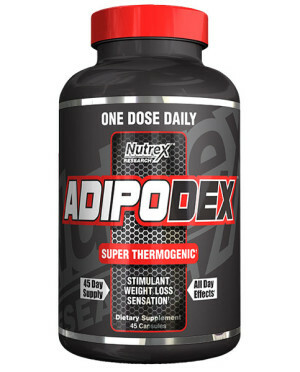 Introducing Nutrex Adipodex – The first major brand to release an AMP Citrate powered fat burner! Nutrex Research is famous for their massively popular Lipo-6 series of fat burners and weight loss products, which now consists of at least 13 products (see them all by searching for Lipo-6 on PricePlow). But Nutrex isn’t sitting still as new technologies come out and advanced users want more aggressive stimulants. 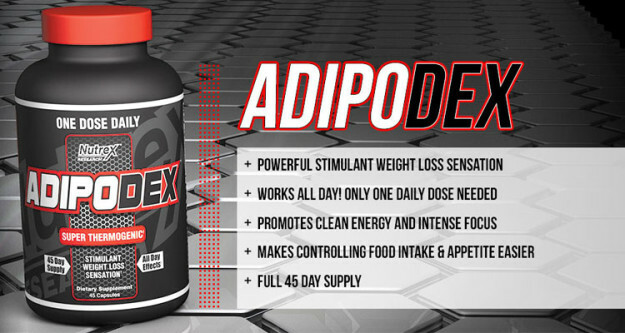 This fall, they have released Adipodex, which is the first major company to release a product with the up-and-coming stimulant, AMP Citrate. Right off the bat, we’re extremely disappointed (yet not surprised) to see that this is a completely proprietary formula. This means that we have no clue how much of any ingredient we’re really getting – not even caffeine! The dosing is also a bit odd, but we’ll get to that lower down. We should all know what caffeine does for us by now. The problem is, we don’t know how much is in here. Seeing that this is the first ingredient, and it’s to be taken once per day, we’re going to guess that it’s a bit on the high side. 250-300mg??? It’d be appreciated if Nutrex at least told us this so we know what to expect. Shapow! It’s the new stimulant, also known as AMP Citrate. 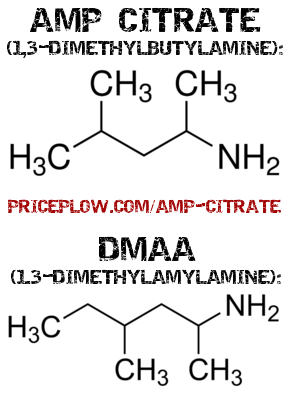 AMP Citrate seems to be the “Next Big Thing”, and is structurally similar to DMAA. But how much of this Ampheta-Tea is actually AMP Citrate? This is structurally similar to the now-banned DMAA, and is often known as DMAA-lite. It requires a higher dosage than DMAA did (ie 150-300mg instead of 20-40mg), but feels similar… which means it definitely feels good. There is very little research on the compound, and none that has to do with fat burning. However, given its structural similarity to DMAA, which is structurally similar to ephedrine, it may provide some ephedrine-like effects, which are compounded by the caffeine. This is currently conjecture, though. It is in a quasi-legal status, and at some point, we are guessing that the FDA will want to see proof that it’s found in nature. Some companies claim it is in Chinese white tea, but that’s to be determined. Anecdotally, users have been reporting that tolerance rapidly builds up with it. Nutrex is the first major supplement company to be using it. Due to the question marks around this interesting ingredient, we’re not surprised that Nutrex didn’t put this one under the Lipo-6 family. However, they’re quick to jump on the AMP Citrate bandwagon, and we can almost guarantee some level of success with this product because of it. It’s going to feel good. This is the most bioavailable form of L-Tyrosine, which is used to enhance cognitive focus. Beyond mental focus improvements, research backs L-Tyrosine supplementation for stress reduction and an improvement in “overall well-being”. Make no mistake, this one is here for the feel and the focus – these first three ingredients will help cut through the fog of dieting…. but when are we going to start burning fat? Theobromine is the ingredient that’s popular in chocolate that is a great sister-supplement to caffeine. It is synergistic with caffeine, and behaves like a mild version of the main stimulant. Theobromine provides longer-lasting energy – it has a has a 7 to 12 hour half-life (depending on the your metabolism) compared to that of caffeine, which is only 2.5 to 5 hours. It also lowers blood pressure, which is good considering the other stimulants might raise it (this is likely from AMP Citrate, since its relative, DMAA, raises blood pressure). The problem is, once again, there’s no direct research on theobromine and weight loss or lipolysis / fatty acid oxidation. Since it’s a stimulant, it could definitely have some quality fat burning properties – we just haven’t seen any research to back this up. Here we go – this is your true proven fat burning counterpart in Adipodex! There’s no doubt yohimbine is great for fat loss. The issue is that it can also cause anxiety, which is far worse for some people than others (about 1% of users simply cannot take it). This leads us to wonder what the dosage is here. Ideally, you want enough to get some serious fat burning going on. But on the other side of the coin, Nutrex is a major company who will be selling this to tens of thousands of individuals – some that are yohimbe-sensitive. Pro-Tip: When taken on an empty stomach, the appetite suppression is far more pronounced. This is why it’s a good idea to take the dosage 15 minutes before your first meal. Bioperine is the tradenamed form of black pepper extract that’s standardized for piperine. This is added to supplements to improve the absorption of the other ingredients. It’s been quite popular lately, and some of the most successful products by some of the hottest brands of 2014 are using it (Myokem and Chaos and Pain, to name two). There are two studies mostly cited in terms of piperine’s absorption capabilities: one that boosted curcumin bioavailability by 2000%, and another involving drug metabolizing enzymes. While we don’t have any research on Bioperine’s absorption improvements with any of the Adipodex ingredients, it’s a beneficial thing to have and we’re happy to see it inside. Nutrex is playing it safe with the dosage, and we’re not sure how this is going to really go over with its customer base. There are 45 capsules in each bottle (a small amount), but you’re only supposed to use a maximum of one capsule per day. Furthermore, Nutrex is recommending that you take it in a three days on one day off pattern. That is basically unheard of in a fat burner, but is probably set this way because of AMP Citrate’s tolerance situation. This means that if you use the product to its specifications, the bottle will nearly last two months. If we take the capsule in the morning, can we take other stimulants, such as a scoop of pre-workout, in the afternoon? What do we do on the day off? Can we take any stims? Coffee even? Ultimately, the big proprietary formula and unanswered questions are what’s keeping this product off our Top 10 list. At some point, a major company had to jump on the AMP Citrate bandwagon. Nutrex is smart in this fashion, yet are clearly playing it “safe”. However, we’d feel a lot more comfortable with this product if we knew how much caffeine was in it. Even better if we knew the AMP Citrate dosage. Hopefully Nutrex will slightly open up the label and we can update this post, but we’re not holding our breath. Below, you can compare prices and sign up for price drop notification alerts. At the time of writing, the product seems valued pretty well, given that there are just 45 capsules in the bottle. 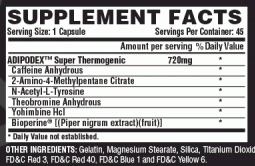 No Comments | Posted in Supplement News | Tagged AMP Citrate, Fat Burners, Nutrex.